Add an interesting, ravishing touch to your flower beds mid- to late-spring with the Ocelot Iris. 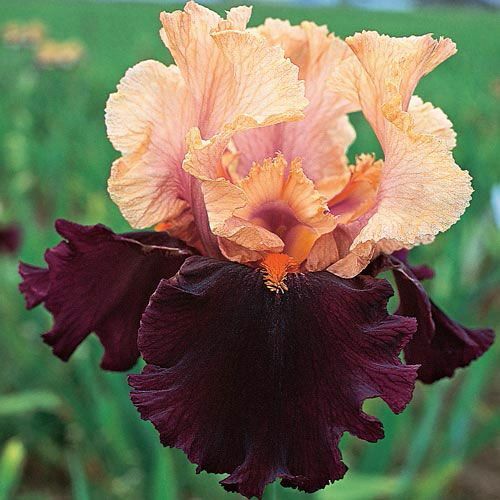 This bearded iris flower features a skirt of dark maroon ruffled falls that supports the pale peach arched and ruffled standards. A bright tangerine beard completes each perfect bloom. The green sword-like foliage forms a smooth, vertical contrast to the swirling petals of the flowers. The Iris germanica "Ocelot" thrives in hardiness zones 4 to 9, and flourishes in full sun or part sun. 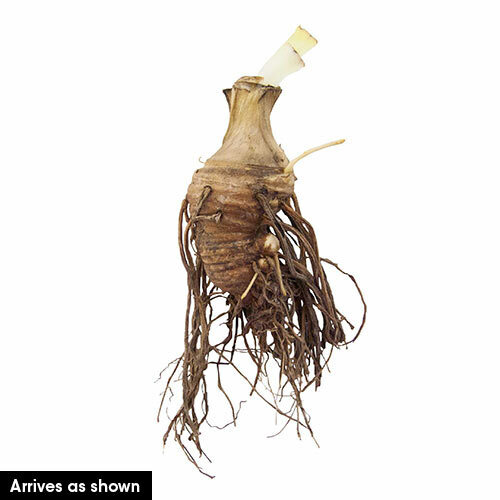 This perennial thrives equally well in loamy, sandy or clay soil, and rhizomes should be planted 1 inch deep and 12 to 24 inches apart. The Ocelot Iris has a spread of 12 to 18 inches, but doesn't like to be overcrowded; divide the clumps of this tall bearded iris in late summer every fourth season. Grow these tall irises in a rockery, an herb garden, at the back of a border, or in the centre of a circular bed. Plant in clumps for an impactful showing, and colour coordinate them with other perennials with foliage and blooms of similar or contrasting shades. A patch of these irises in a container on a patio or near a swimming pool adds colour and fragrance to your entertainment areas. Select the Ocelot Iris this growing season for a ravishing spring array. An outstanding bicolour, the easily recognized Ocelot wows with pale peach, ruffled and arched standards that are set off by a skirt of black-maroon, heavily ruffled falls. Bright tangerine beards create even more startling contrast. Flower Color Pale peach standard, blackish-maroon falls and a tangerine beard.